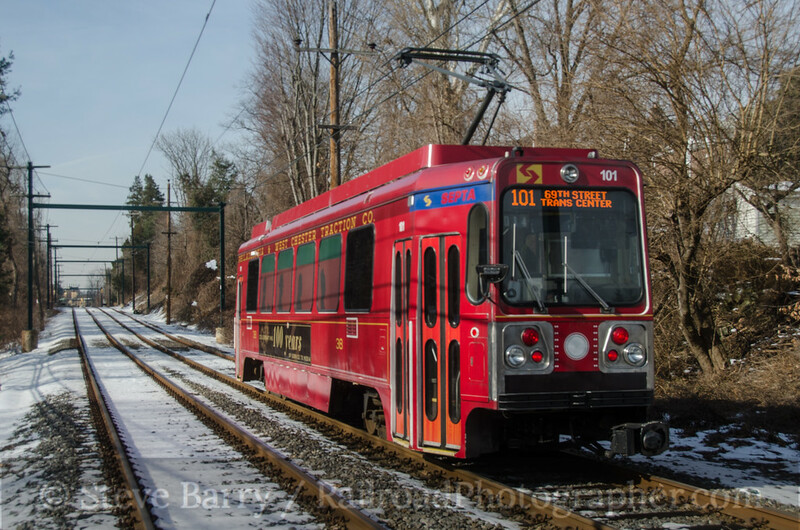 The Wilmington Chapter of the National Railway Historical Society has traditionally operated a streetcar charter over the Southeastern Pennsylvania Transportation Authority on the day before the Super Bowl. This year's trip, in keeping with the Super Bowl tradition of Roman numerals, was Super Saturday Streetcar Special XXI. 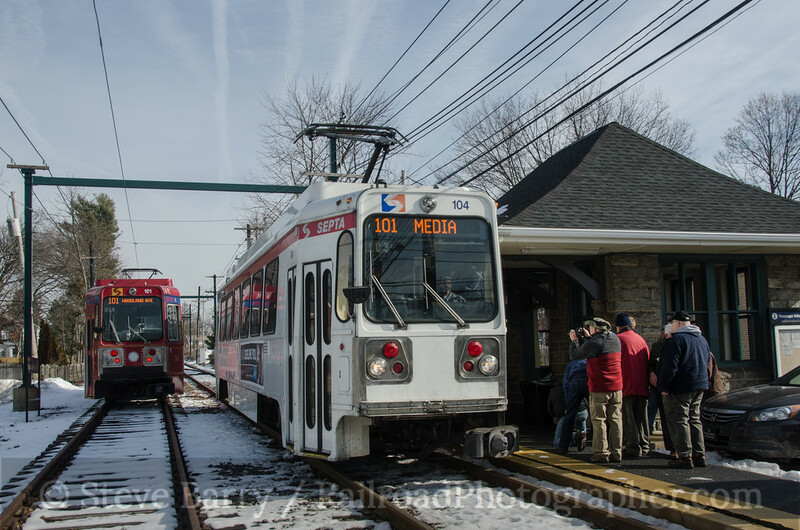 This year's trip was held on SEPTA's Red Arrow Division which includes the light rail/streetcar hybrid lines from Upper Darby, Pa., to Media and Sharon Hill; the previous Super Saturday trips had been held on the City Transit Division which is comprised of the streetcar lines within Philadelphia's city limits. As usual, your writer served as the coordinator for the trip. And as usual, the trip included a number of photo stops. Special for this trip was the use of Kawasaki car No. 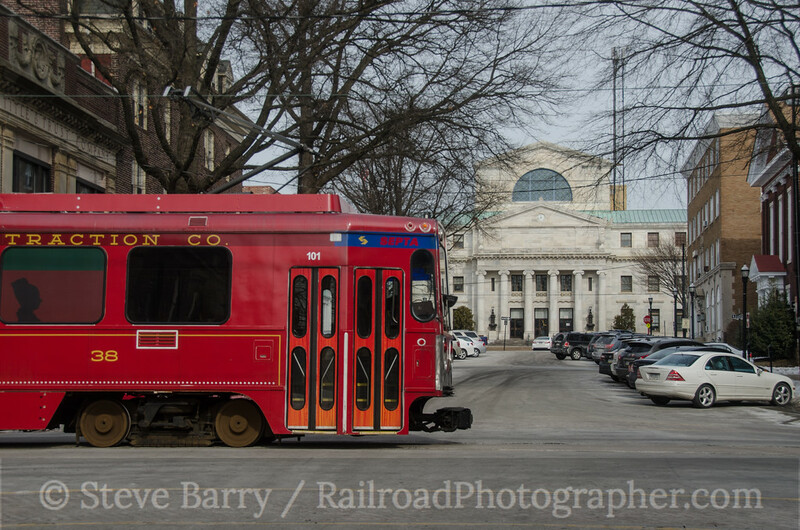 101, wrapped for the 100th anniversary of the Philadelphia & West Chester Traction Co., a predecessor of Red Arrow. The first stop was held at Anderson Avenue in Drexel Hill (above). One of the challenges of any charter is staying out of the way of regular streetcars. The Red Arrow Division consists of three rail lines (and several bus routes). 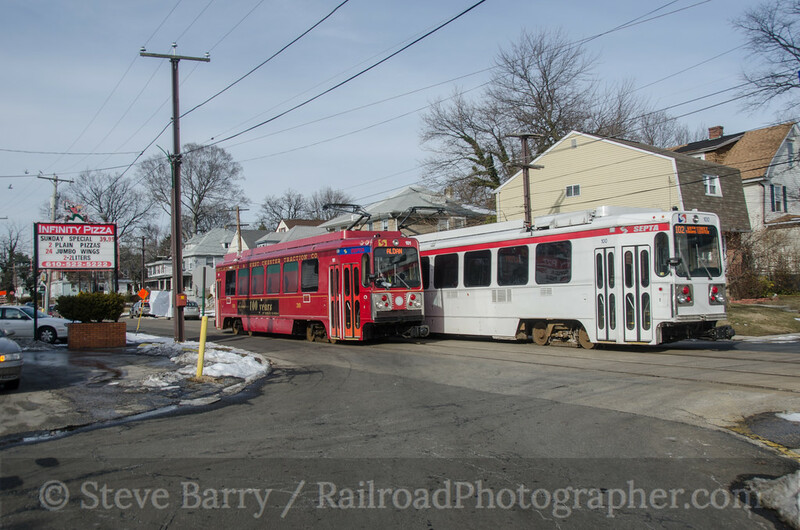 One rail line is the separate Norristown High Speed Line from 69th Street to Norristown; this is more of a modern interurban line, completely grade separated over its entire length. 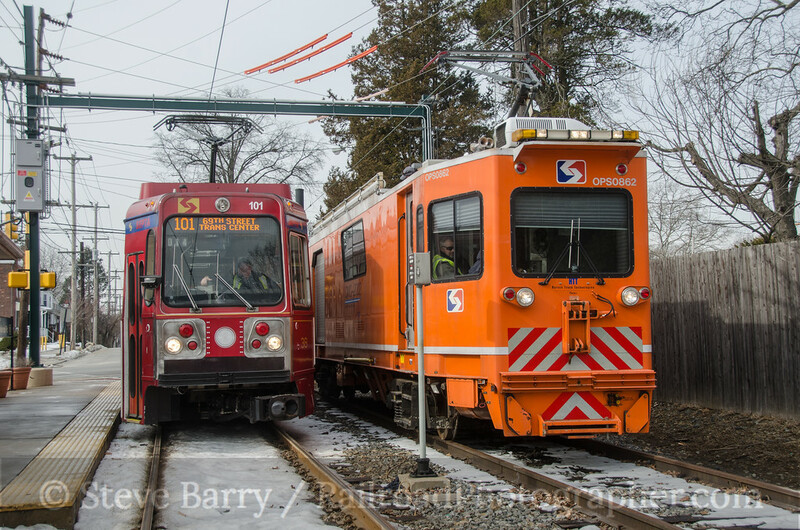 The other two lines are the Media and Sharon Hill lines, which share the track from 69th Street to Drexel Hill Junction. 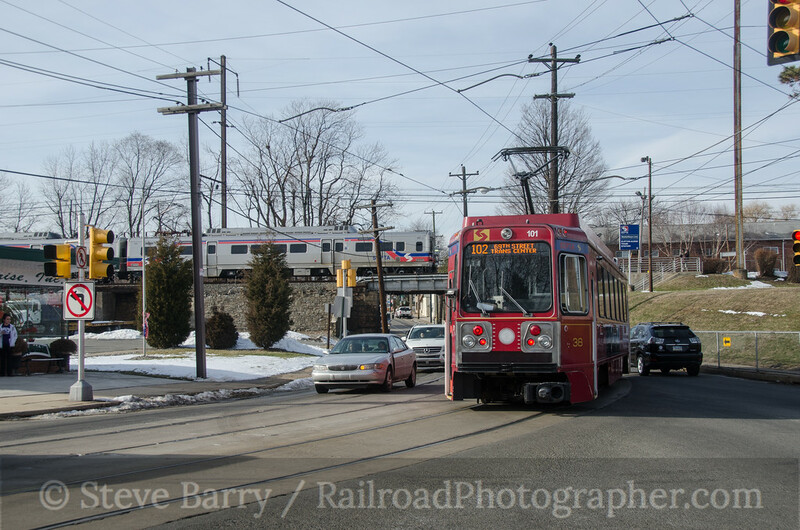 the Sharon Hill line is double track for almost its entire length, save for the final mile or so into Sharon Hill. The Media line is also single track as it is entirely street running in the town of Media, and it also has a stretch of single track through some forested areas in Springfield. Since one of the best photo locations is on the single track, a stop was made at the end of double track to let regular traffic clear. With regular traffic gone, the trip proceeded to the Paper Mill Road station, where a short walk leads to a road bridge in Smedley Park, conveniently parallel to the rail line. The forecast leading up to the trip had been bad all week, but the sun was out and we got the signature shot out of the way in strong sunlight. From here the trip went to the end of the line in Media. 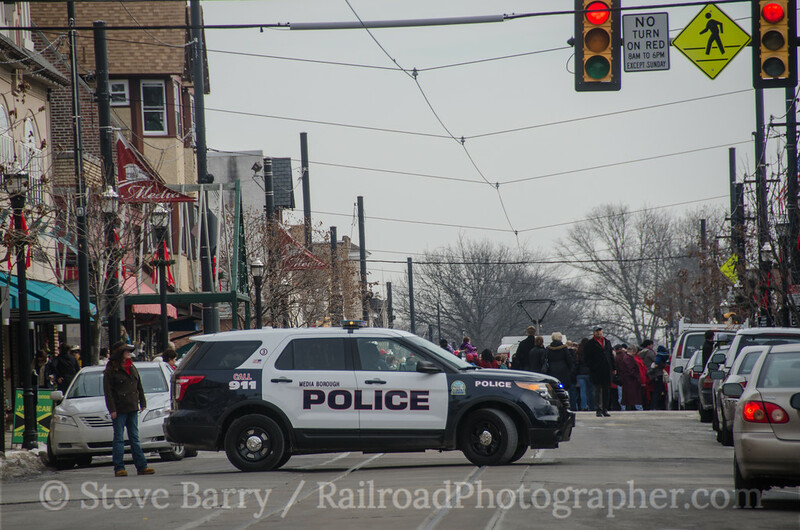 Just after getting through, State Street was shut down for a Chinese New Year parade (SEPTA was not informed ahead of time that this would be happening. The regular service car behind us was cut off from reaching the end of the line (we could see it poking above the parade up the street), while we were stuck with no place to go. Taking advantage of the closed road, we proceeded towards the parade as far as we could go to get a shot that included the court house. SEPTA's wire car was out checking the overhead electric lines, and they knew before heading out from Upper Darby that they might be recruited for a couple of photo opportunities. The first one occurred as our car came off the single track out of Media. The wire car was there waiting to go in, but they had time to wait for us to get a few photos. From here we headed back into 69th Street for a rest stop. 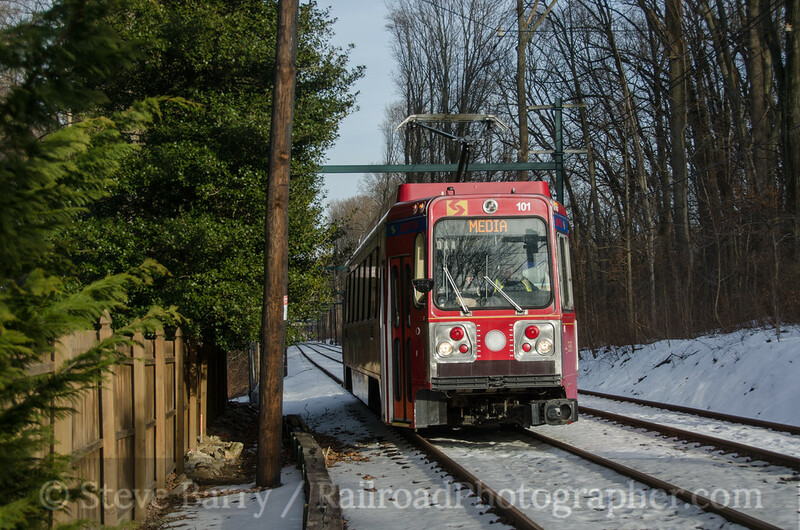 Once that was done, we came back out and made a left at Drexel Hill Junction to head down the Sharon Hill line. 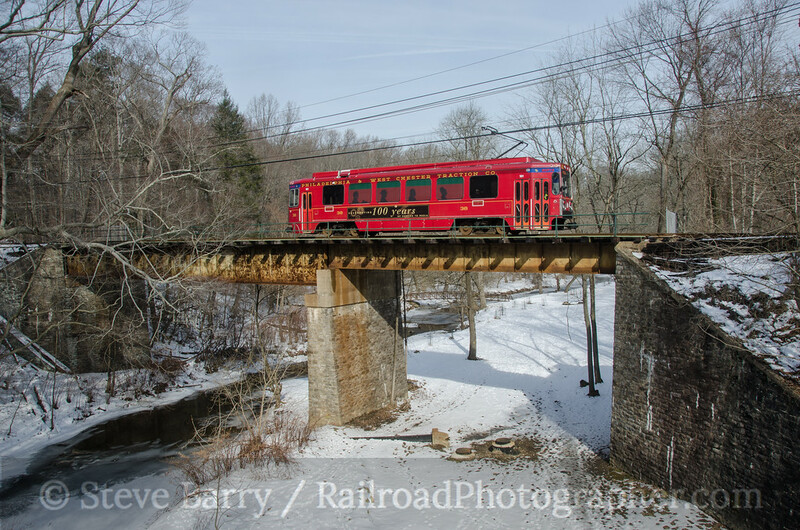 Our first stop was at a bridge over Darby Creek in Drexel Hill, and the wire car (which had run all the way to Sharon Hill and back during our rest stop) was waiting to be included in one more photo. 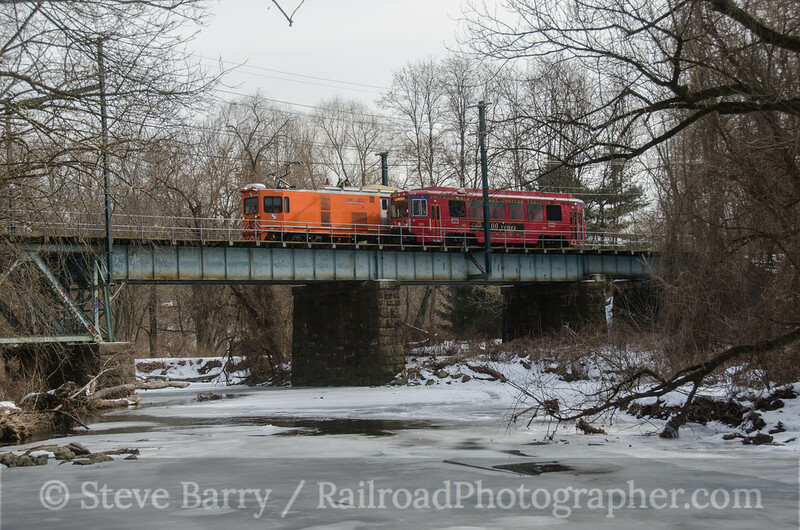 The "must get" shot on the Sharon Hill line would be an over-under with a SEPTA regional rail (heavy rail) train where the streetcar goes under the railroad at the Clifton-Aldan station. This required getting some regular service traffic cleared, so we had a meet with a regular car at Darby before reversing direction to follow it back to the railroad. It took some juggling of regular streetcars, a lot of traffic and a late train, but the over-under did come together at the Clifton-Aldan station. Both prime shots -- Smedley Park and here -- had been accomplished. From here it was on to Sharon Hill. Our car followed a regular service car in, but photographers could get off one stop short at McDade Boulevard in Darby. From here our car could be photographed with the regular service car in the distance in Sharon Hill. The railroad overhead is CSX's Philadelphia Subdivision, the former Baltimore & Ohio main line. 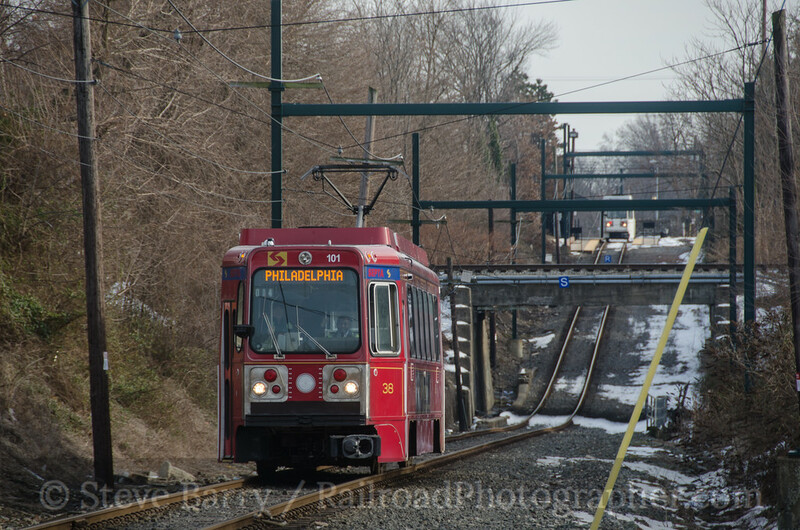 The sun was only getting better, so at Drexel Hill Junction we headed back out on the Media line to Pine Ridge Road in Media. A nice set of shots were made here at the rural grade crossing at the station. Once we were done here we made one last photo stop in SPringfield, then headed back to Upper Darby to end the trip. A complete set of photos from the day can be found here.